Burning Man has attracted attention from anthropologists for its distinctive nature. This paper argues that Burning Man combines religious and tribal elements. Religious elements are seen in the pilgrimage-like and ritualistic nature of Burning Man. Tribal elements are seen in the egalitarian and non-hierarchical nature of the gathering. Further, these spiritual elements recall the animism of tribals; while Burning Man’s pilgrimage to the playa, its 10 principles, and its worldwide following recall a religious structure. The worldwide following is emphasized here. It is argued that the traditional view of Burning Man as a single, 7-day event is unhelpful, while a broader view of Burning Man as simply the annual pilgrimage of a worldwide, religious-like community is more instructive. In this view, Burning Man is less an event and more a pilgrimage that abandons the expected religious hierarchy and structure in favour of organizing principles that mimic small tribes, with a big man social structure, accompanied by a spirituality reminiscent of tribal animism. 1.4 What is Burning Man? 3.1 What is a Pilgrimage? 3.4 Is Burning Man a Pilgrimage? From 2007 to 2014, in the US, the religiously unaffiliated grew 6.7% to 22.8 million. No other religious group is growing in such great numbers . This result comes at a time when the definition of religion has been expanding to groups such as CrossFit and American football . Are other institutions and practices filling the void left by the decline of traditional religion? If we agree that “Religion … is one of the cornerstones of the evolution of large-scale complex societies”  then there must be “neo religions“. What do these neo religions look like? In mainstream media, Burning Man is framed as an event with a defined beginning and end. Burning Man begins a week before Labour Day and ends on Labour Day. In popular consciousness, everyone packs up on Labour Day and goes home to their normal lives. They came back the next year, transform into hippies for 7 days, rinse and repeat. However, my personal experience when fully participating in the culture of Burning Man, “burner culture” for short, belied this view. Instead, the attendees, or burners, return to their regional burner groups and participate in gatherings and festivities all year-long. Burning Man does not have an end or a beginning. There are 26 “regional burns” in the United States. There is an “Afrika Burn” in South Africa, and a “Mid-Burn” in Israel. There are burns in Europe and Australia . Burning Man is simply the tip of the iceberg. The true extent of burner culture remains hidden from mainstream view. Viewed in this context, Burning Man appears closer to a distributed, worldwide subculture. At what point does a subculture become a culture and perhaps a neo religion? Burning Man is an annual gathering in the Black Rock desert, 4 hours north-east of Reno, Nevada, USA. The first gathering occurred in 1986 when a group of friends burned an effigy on a beach near San Francisco. Today the gathering reaches capacity at 70,000 attendees, called burners, and is known for its freewheeling culture and rejection of money besides its art, music, and self-expression. Its counterculture roots and embrace of fire as a ritualistic element stand out. Burning Man has also attracted negative attention in recent years for rich attendees who are spectators and not participants. For more, please see my photo journey. The first burn composed 20 friends. From that burn, a global culture of hundreds of thousands (and possibly millions) of burners has emerged. This phenomenon does call for explanation. Regarding Burning Man itself, why do 70,000 burners spend a significant amount of money and time to travel to the middle of nowhere for a week with no access to the amenities of modern life? It seems illogical. Further, these 70,000 people live in extremely close proximity in a harsh desert environment. Even so, violence is extremely rare at Burning Man. The event bans money and instead attendees “gift” each other items. What motivates 70,000 strangers to trust each other and make this expensive journey every year? Further, artists who attend Burning Man spend months fundraising and designing their art projects for just 7 days of making strangers happy. Why? 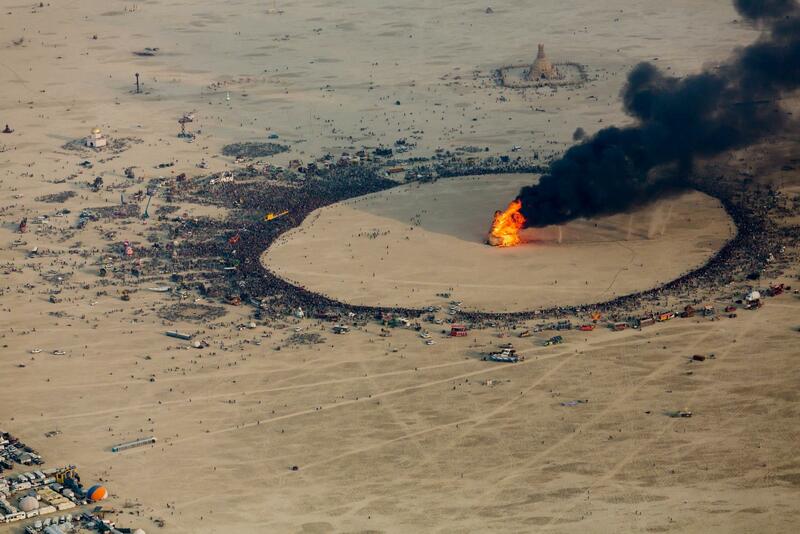 Some observers dismiss the 70,000 burners as hippies in the desert. Do we concur or do we admit there is something new here? How did this event create a worldwide culture that resembles a religion? To examine if Burning Man is a new culture requires looking at burner practices and culture. People who strongly identify as burners return to Burning Man year-after-year. They attend regional burns and gatherings throughout the year. Many, and sometimes all, their friends are also burners. They participate in burner culture by working on art projects or organizing gatherings―both larger gatherings where anyone is invited and smaller gatherings for the burner community. Burner culture and other burners act as their social safety net, especially because burner culture emphasizes inclusion and acceptance. For many burners, Burning Man is where they celebrate their identity. Burning Man is a pilgrimage where they “return home” to renew their sense of community and confirm their identity. When we say “burner”, we think only of those who attend Burning Man. However, thousands of burners attend regional and international burns. 9000 burners attended Afrika Burn in South Africa and 6500 burners attended Mid-Burn in Israel. Thousands of burners do not attend Burning Man but attend regional burns, such as the 1000 attendees at the Firefly burn in Vermont, USA. While there is no rigorous way to count the number of people who have ever attended a burn, a safe estimate would be in the hundreds of thousands, up to low millions. The point here is not to find a number but to emphasize that burner culture is much more than Burning Man, and that Burning Man only represents the tip of the iceberg. From my personal experience of having attended Burning Man twice (‘13 and ‘14), and from the some dozens of burners I’ve spoken to, there is a feeling that those who have attended Burning Man understand something that others do not. Burners view Burning Man as a transformative experience which provides an instant sense of understanding between those who have attended it. This creates a sense of community where burners work together on art projects, regional gatherings, and art festivals to bring the burner ethos into life outside of Burning Man. In varying degrees, burners attempt to incorporate Burning Man into their daily lives or use it as a starting point for engaging with other burners. What is key is that Burning Man does not stop at the fences of Black Rock City but continues on in the lives of burners as a community. While burner culture started at Burning Man, now Burning Man is simply where the community gathers once a year, similar to pilgrimages in traditional religions. At your typical festival, the organizers plan events, find musicians, and commission artists. The attendees simply turn up and enjoy the entertainment. At Burning Man, the organizers do not plan any events except the burns, such as the Man burn and Temple burn. They simply lay the infrastructure and provide the wide open playa and as an empty canvas for burners to paint on. Everything you experience is gifted to you by a participant. Burner culture is created by the burners themselves. This follows the principles of participation and self-expression. I feel this characteristic sets burner culture apart from other festivals, as a culture created by participants for participants. There is no corporate sponsorship, no obvious hierarchy, and no money changing hands. Pilgrimages are a defining characteristic of all major religions. Christianity, Islam, Hinduism, Judaism all have incorporated pilgrimages with varying degrees of obligation and adherence. Stoddard attempts to define a pilgrimage as “an event consisting to longer than local journeys by numerous persons to a sacred place as an act of religious devotion” . For example, every Muslim is expected to complete the Hajj pilgrimage to Mecca at least once. In Hinduism, major pilgrimages include the Amarnath yatra, the Kumbh Mela, and the Kailash Mansarovar yatra. Christianity has numerous pilgrimages, among the more famous is the Camino del Santiago in Spain. In Judaism, pilgrimages to the Temple were required thrice a year. Following Stoddard’s definition, Burning Man arguably contains some resemblance to a pilgrimage. It is certainly a long journey by thousands of people. Burners do tacitly treat the desert, or playa, as transformative and sacred. For example, burners will take home playa dust and some will carry capsules of playa dust or some memento of the desert with them. The playa is spoken of as a home where one undergoes a transformative experience. It is not clear yet if Burning Man is a “religion”. It certainly is not a traditional religion and we do not know what “neo religions” look like. The event itself can be arduous as the desert is subject to wild temperature swings from freezing temperatures to extremely hot days accompanied by whiteout sandstorms that can blow tents away (2015) or sudden rainstorms that can bring the event to a halt (2014). Further, Burning Man requires a significant investment both in time and money. The total cost of attendance can come to $1500 or more covering the ticket, airfare, and supplies. Planning takes months starting from buying the ticket to working one’s way through an exhaustive checklist of items and finding a group to camp with. Burning Man stresses its principles of radical inclusion and gifting. When asked about Burning Man, attendees typically stress the degree of social bonding and the free-flowing social interaction at the event. My experience and those of burners I talked to was that burners at Burning Man leave their identities behind. There are no markers or symbols to identify a person’s class or status. There is a leveling of sorts where anyone can commune with anyone else. Burners often report a sense of breaking down of social boundaries at the event. The rules and standards of typical society do not apply for those seven days. After Burning Man, burners report a “glow”, best translated as an inner feeling of well-being and ease with social interactions that lasts several days. It is up to the reader to decide if Burning Man meets the criteria for communitas in its breaking down of social norms and leveling of the social hierarchy. My view is that it does. Is Burning Man a Pilgrimage? Because of the journey, the liminal nature of the event, the degree of social leveling and communitas, and the scale of the event, Burning Man does possess hallmarks of a pilgrimage. It is a liminal experience and attendees report a transformative experience with a desire to take their experience back with them. They describe an instant understanding between those who have attended Burning Man. What’s noteworthy is that Burning Man induces citizens of a advanced economy participate in a pilgrimage with religious elements. Because, as Turner notes , “optimal conditions for flourishing pilgrimage systems of this type are societies based mainly on agriculture, … with, at the most, only a limited development of modern industry”. Burning Man contrats with this observation with its heavy attendance from highly-skilled members of highly advanced societies. Turner described how all his interests “converged on pilgrimages”, which are a kind of ritual. A ritual is a sequence of steps performed in a set order at a certain place. Rituals are an important part of religious activity. For example, visiting a temple, synagogue, church, or mosque. Rituals are signals and convey commitment to the group . If one applies Zahavi’s handicap principles to rituals, then expensive rituals are unmistakable signals of commitment to a group. In Israel, communes (kibbutzim) whose members attended synagogue regularly did best (Sosis, Ruffle 2003). Sosis argues that the public signalling engendered by synagogue attendance bolstered cooperation in the commune. Further, when participants in a study received the same sensory stimulus as their partner, they said they felt trust and a resemblance to their partner . Synchrony is an underlying part of rituals that promotes social bonding . Fisher et al. describe how rituals that require synchronous body movements and belief in sacred values increased prosocial behavior the most. Further, rituals coordinate empathetic arousal amongst the audience and performers, extending cooperative benefits . The act of a pilgrimage is itself a ritual, as described in the previous section. Rituals also occur during Burning Man. The most obvious rituals are the burns themselves. These involve burning large wooden structures and take place in regular, pre-announced order on the same days of the week every year. Thursday: The regional structures are burned. Friday: Many art projects are burned. One of the most famous burns I witnessed was that of the Embrace sculpture at sunrise. Saturday: The biggest burn–the Man burn–brings thousands together in a circle as art cars surround the perimeter. After the burn is declared safe, burners rush the still-burning Man and spontaneously circle the fire. Sunday: The Temple burns. The Temple burn rivals the Man burn in size and is conducted in complete silence as the Temple remembers those whom burners have lost. Besides these, there are the rituals of dancing. Burning Man typically contains several large dance camps with hundreds of dancers at a time. Perhaps, these experiences trace back to rituals that require synchronous body movement (dancing) with the same sensory stimulus (music) as described in  . There are many other smaller rituals. There is the ritual of the gate greeting where burners will greet those arriving with a “Welcome home!”. And where first-time (virgin) burners must make a “dust angel”. Burning Man is also typically host to a few dozen weddings. And above all, the process of preparation, arrival, setting up a camp, taking in the sights and sounds of Black Rock City, going to the dance camps, exploring the art, conversing with dozens of strangers, witnessing the burns, and returning to share one’s experiences, all constitute a ritual. Every religion has its own version of guiding principles. Christianity has the 10 commandments in the Bible. Hinduism has Krishna’s exhortations to Arjun in the Bhagvad Gita. Islam has the Koran. Sikhism has the Guru Granth Sahib. These core principles do not change, though they may be subject to interpretation. They are rules that are written down and they are static. Similarly, Burning Man has 10 written principles that have not changed since inception. They are not expected to change nor is there a process to change. The difference between Burning Man and traditional religions is that the principles of Burning Man are only guidelines and are not enforced. Given this caveat, Burning Man has parallels to how traditional religions prescribe fixed rules, supposedly immutable rules. Radical Inclusion: Anyone may be a part of Burning Man. Gifting: Burning Man is devoted to acts of gift giving. Decommodification: Social environments that are unmediated by commercial sponsorships, transactions, or advertising. Radical Self-expression: The individual expresses themself — a self-expression arising from the unique gifts of the individual. Civic Responsibility: We value civil society. Community members who organize events should assume responsibility for public welfare and endeavor to communicate civic responsibilities to participants. Leaving No Trace: Our community respects the environment. We are committed to leaving no physical trace of our activities wherever we gather. Participation: Our community is committed to a radically participatory ethic. Immediacy: Immediate experience overcomes barriers between us and a recognition of our inner selves, the reality of those around us, participation in society, and contact with a natural world exceeding human powers. The frameworks of pilgrimage and rituals used here have been derived from traditional religions. Thus, they do not apply perfectly to Burning Man. Yet one can see the contours of traditional religions when one analyzes Burning Man. Perhaps one must re-interpret our traditional notions of pilgrimage and ritual to understand how Burning Man fits or borrows from them. In this spirit, the next sections examine where Burning Man deviates from traditional religion and veers into what is more reminiscent of our tribal past. In a tribe without a defined leader, called an acephalous tribe (Igbo of Nigeria), tribal social structure is accepted as being highly egalitarian. Any attempt to impose hierarchy is fiercely resisted by the group . Tribes are composed of bands of humans, each band numbering in the dozens. The bands are genetically and linguistically related to each other. Acephalous tribes have no inheritance of status and no chief. Several bands form a tribe where relations are maintained through mutually intelligible languages, reciprocal gifting, wife exchange etc. In small tribes, at most, an influential individual, called big man, can attempt to sway other tribe members. but cannot determine the outcome of a discussion. In such acephalous social structures, there is no hierarchy. In fact, it is impossible to decide a person’s social status through a glance. For example, even a master craftsman has to “grow his own sweet potatoes” . This stands in contrast to modern society where a person’s clothes, manner, and speech quickly convey their status amongst a myriad of other clues. Lastly, this was a short, crude description that ignored the complexity of tribal societies. There is an immense gradation between small tribes and large chiefdoms. This section must begin with the caveat that Burning Man and Black Rock City exist only for 7 days. It feels silly to assign a social structure to a group that does not have to solve problems of long-term survival. Nonetheless, it can be instructive in the sense that assigning a social structure creates a framework and helps one recognize where behavior comes from. At Burning Man, any burner can talk to any other burner and explore any part of Burning Man. The principle of radical inclusion asks that everyone be welcomed. From my Burning Man experience, it is impossible to decide a person’s social status through a glance. There is no set hierarchy or status. In the rituals of traditional religion, one expects priests and kings to command the rituals. Those in charge would be easily identified through their precious metals or stones they wear, or elevated positions and attendants. There is no such symbolism at Burning Man. The hierarchy at Burning Man instead parallels the big man hierarchy of an acephalous tribe where those who work are accorded higher status, while those are merely spectate are looked down upon. This hierarchy stands in stark contrast to traditional religion and everyday society. This is why it is argued here that Burning Man parallels the extremely egalitarian structure of acephalous tribes where there is a big man hierarchy but no inherited or rigid hierarchy. The 70,000 burners together form a social structure that is similar to an acephalous tribe, organized into camps just as the tribe is organized into bands. Specifically, it is useful to note that the vast majority of camps do not exceed Dunbar’s number of 150  similar to tribal bands. In each camp as in a band, it is possible for every member to know every other member. In recent years, the issue of wealthy burners buying a tourist experience for themselves has generated a lot of attention. It remains to be seen how this affects the egalitarian ethos of Burning Man in the long run. The counter-argument exists that exposing wealthy burners to Burning Man can move them towards the 10 principles. That a society 70,000 strong can exist without a hierarchy is very interesting. According to Turchin , “It appears that an acephalous tribe is the largest social scale a human group can achieve without the benefit of centralized organization”. Undoubtedly, Burning Man attendees do not have to face long-term survival together and so one should not make too much of this, except to note that a temporary society without hierarchy has scaled beyond the limits of an acephalous tribe (a few thousands). Perhaps there is something to learn from the social structure, the principles, and rituals that occur at Burning Man. Further study is required. Outside of Burning Man, the local burner communities and the BM organizers do face long-term survival together. These communities and organizations operate in a big man fashion where those who do the work gain leadership positions. Again, there is no inherited or fixed hierarchy. In this manner, the structure is fluid and tribal. Again, these groups are not governments and thus caveat applies that we are not examining a fully functioning, independent society, which narrows the scope of our conclusions. In the past few decades, anthropologists have recognized animism to be a legitimate worldview. Those who practice animism see entities in the world as alive and connected through a web of relations to other entities . Everything is connected in a web of relationships . Things are known by the paths they leave. For example, the Ojibwe of the Great Lakes region see “‘the world of personal relations in which the Ojibwa live is a world in which vital social relations transcend those which are maintained with human beings” . In another example, “When an Australian Aboriginal man proclaims himself to be a kangaroo, he means that he – along with other persons who share this affiliation – actually partakes of the same substance as the kangaroo. The connection, in other words, lies in the essential consubstantiality of members of the human group, and of the animal species, all of whom derive the lineaments of their being from the same place in the landscape in which is deposited the creativity of the kangaroo ancestor.” Animism relates to a feeling of one-ness with the natural world, to the impression that the same substance forms the individual and the world, and that that same-ness forms a spiritual connection that allows the individual to transcend their own existence and exist as part of the natural world. In modern-day hippie spiritualism-speak, everything is connected through “energy” and the world and us are one. New-age hippies use terms such as “vibration” to describe the interconnectedness of things. They see themselves and nature as “one”. There are clear parallels between new-age hippie spiritualism and animism. The argument is that tribal animism bleeds directly into the modern spirituality manifested at Burning Man. This supports a common refrain amongst burners that Burning Man is spiritual but not religious. The parallels between tribal animism and modern-day spiritualism support the argument that the social structure of Burning Man is tribe-like, even while the larger ritualistic framework and 10 principles echo traditional religion. There is no money exchanged at Burning Man. Everything between participants is “gifted”. At Burning Man, gifting has no expectation of a return. So you may be fed by a complete stranger whom you will never see again. Why would complete strangers gift each other? Insights from game theory hold that cooperation is only established when individuals have repeated positive interactions . But, in fact, at Burning Man, burners work extremely hard to create experiences for strangers whom they will never see again. One might reason that they are indeed being rewarded in some way. Perhaps the burners who create the art and experiences attain in return some sort of big man social status in the community? Perhaps they are emotionally fulfilled by helping complete strangers. Or perhaps, since they too will be gifted to by complete strangers, then they are indeed being rewarded. Thus, if a critical mass of attendees gifts without condition, then every attendee is guaranteed to receive gifts in turn. Hypothetically, this could set up a virtuous cycle of gifting. Why hasn’t such a society been created before? A society where every member selflessly gifts to other members sounds utopia-like. Gifting is an ancient human practice. It is the exchange of valuable items, where either side is expected to return a gift equal in value in turn, and not returning a gift or returning a gift of a lesser value is seen as a slight. Reciprocal gifting is a common practice in tribes to maintain relationships . Graeber, in his book “Debt”, describes how on a personal level people “gift” things like cigarettes, tools, or directions to a place, because “gifting” is the most efficient system, with the implicit expectation is that the other person will gift back when necessary. However, instituting a gifting system between 70,000 strangers who will never meet again is different from the gifting-between-neighbors that Graeber describes. I personally am not aware of any such switch to large-scale gifting. How would this switch arise? One might hypothesize about a society where members have a surplus of resources. In such a society, each member does not lose by giving away a part of the surplus to a stranger if one thought of the stranger as a neighbor. That is precisely the sentiment that the liminal experience of Burning Man creates, forming communitas where ordinary social norms break down and pilgrims view all mankind as a homogeneous, unstructured, and free community . In such a society, a virtuous cycle of seemingly selfless gifting might propagate. The argument is that this is what happened at Burning Man, where the high living standards and surplus resources of US society created the conditions for large-scale gifting, where scale refers to both the number of people and the scale of the gift. Lastly, there is a reciprocal aspect to gifting at Burning Man, because burners often return year after year, and make friends whom they then meet annually at Burning Man. Additionally, burners participate in their local Burning Man communities and thus have repeated interactions with the same people. Burning Man exists for only seven days which is not a sufficiently long time period to evaluate a phenomenon: The response here is that because burner culture continues outside of Burning Man and burners participate in that culture outside of Burning Man. Selfless gifting is no different from charity: Incorrect, because charity often has tax advantages, or the benefactor receives public recognition and status, or both . In sum, reciprocal gifting is an old, established practice. However, scaling non-reciprocal gifting amongst thousands of strangers combined with the scale of the gifts at Burning Man has not been recorded before and is a new practice. The religious and tribal elements have been discussed separately. Individually, these elements are easily found in traditional religions and tribes. However, these tribal and religious elements have not been combined before to form a distributed tribe that practices an annual pilgrimage (for lack of better words to use). This is the core of Burning Man. Burner culture uses the religious framework of pilgrimages, rituals, and hardcoded principles to scale the tribal social structure by using the surplus economy of rich societies. Burning Man moves the focus back to the individual unlike religious where the focus is on the priestly and warrior classes. Yet, Burning Man has scaled far beyond the limits of an acephalous, big man social structure by using this religious framework. Arguably, this is how evolution works. By hacking what already exists to create a new adaptation that works. In this light, burner culture represents a cultural innovation adapted to the challenges of modern life that traditional culture cannot meet. In addition, it might be worthwhile to explore the issue of rapid technological change. While every society has probably felt they experience rapid technological change, today we can edit our genomes, have computers fly planes for us, are on the cusp of commercial space tourism, are changing our planet’s geophysical processes ourselves, are connected by the Internet at the speed of light, and have companies with missions such as curing cancer and stopping aging. We are in an age of rapid technological change; perhaps a sort of second Axial Age . Traditional religion is in conflict with this change. That conflict creates a vacuum and a space for neo religions better adapted to that change. To quote Shariff again ,. Burner culture spans the globe and is growing rapidly. Gatherings with thousands of attendees are held annually in five continents, alongside numerous smaller gatherings. The culture (or religion) is incompatible with traditional religious beliefs but is compatible, and indeed arose, with the previously mentioned growing “unaffiliated” society. It remains to be seen whether burner culture grows and lasts or if it remains a subculture oriented around festivals or even if it eventually diminishes. Currently, it is growing rapidly. The main Burning Man event itself is constrained only by the limits of its federal land-use permit. There is no shortage of counter-arguments or criticisms of Burning Man. Often, these are heard from those who have never been and are simply repeating what they’ve heard from others who have never been. But there are some serious counter-arguments. An oft-heard criticism is some form of ”It’s just hippies in the desert”. And that is certainly true to an extent. But at what scale do you admit that “there’s something to be explained here”. Does the burner culture have to reach millions of people? Or billions? Arguably, it already reaches millions across the globe and is growing rapidly. This dismissal is partly justified but partly refuses to acknowledge that the scale and nature of burner culture demands analysis and not dismissal. Another counter-argument is that Burning Man is not a real society because it exists only for a week. And that one cannot apply anthropological structures that evolved over thousands of years to a week-long gathering. The response here is that Burning Man is only the tip of the iceberg of burner culture, it is the culture’s annual pilgrimage, and further, that it sparked a worldwide culture that extends far beyond the event itself. The last counter-argument I have heard is that Burning Man has become the playground of the rich and will become corrupted like any other human institution. The response here is that the rich have always been associated with the arts. The palace of Versailles was built by Louis XIV. The Taj Mahal was built by the emperor Shah Jahan. The arts have always been patronized by the wealthy because the wealthy have the surplus to support the arts. Further, many Burning Man arts projects are supported by crowdsourcing efforts and the free labour of burners. The second part of this argument is that wealthy attendees are attending Burning Man as tourists and do not contribute to the gathering. This is true as in there are certainly such attendees. The scale of the problem is hard to ascertain and all evidence is anecdotal. I do not think these “tourists” have detracted from the gathering yet, but everyone has a different opinion here. Piggybacking onto the last counter-argument is the argument that Burning Man is only for people who can afford the costs. That’s not true. Islam isn’t for people who can afford the costs of Hajj. Christianity isn’t just for people who can complete the Camino del Santiago. Similarly, if one cannot afford Burning Man, one can instead participate in the local burner culture and the local burn (gathering). The cost of the Burning Man ticket defray the millions of dollars in payment to the Bureau of Land Management, the large infrastructure costs, the porta-potties, heavy equipment, police details, feeding volunteers and other expenses. Burning Man shows signs of being a neo-religion that combines traditional religion with hunter gatherer ethos in response to changes that traditional religions cannot adapt to. Burning Man has given rise to a world-wide culture. This culture uses the methods of traditional religion to scale up tribal social structure. The religions aspects, such as the rituals, the pilgrimage, and the 10 principles provide the glue that let thousands of strangers co-exist without a hierarchy and yet maintain order. Whether burner culture (and indeed other “startup” religions such as CrossFit or gamer culture) continue to grow at a rapid clip is a subject of great interest and will likely have a significant impact on our society. Jared Diamond – Guns, Germs & Steel – describes being astonished at how a master craftsman in the Solomon Islands had to grow his own sweet potatoes. Malinowski, B. (1920). Kula: The Circulating Exchange of Valuables in the Archipelagoes of Eastern New Guinea. Man, 20, 97-105. Hi Karen, very interesting article! I’d love to get in touch and speak about it more..